Quiet a while ago, I realised I’ve been told a big lie all my life. 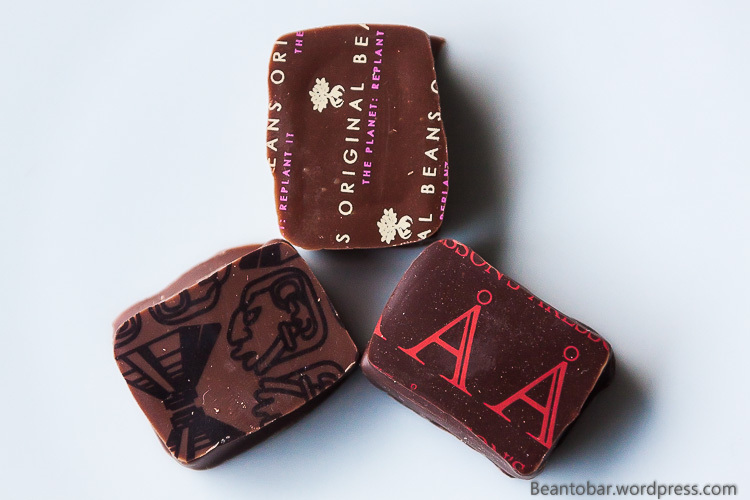 Belgian bulk chocolate may be better than average when compared to other foreign bulk producers, but it is meaningless when compared to the kind of product so many great artisan bean-to-bar producers create in the field of Single Origin chocolate. 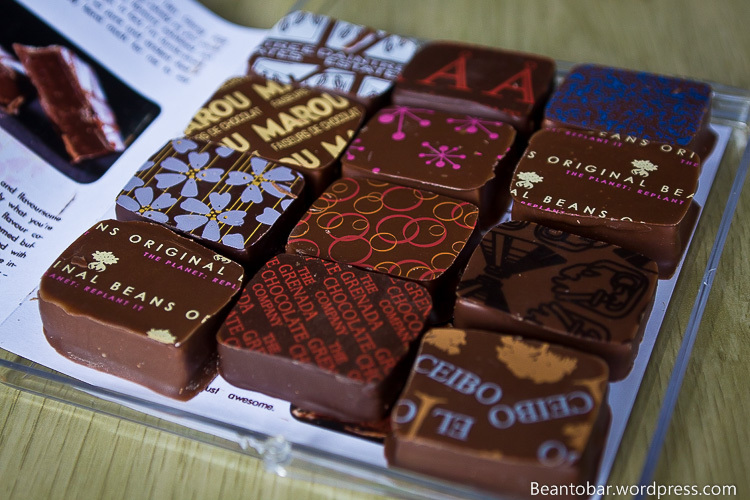 Next to the bars, Belgium is also renowned for chocolates. yeah, confusing, but this time I’m talking about “pralines”, ballotins, the type of chocolates that come in nice boxes. Chocolate filled with all sorts of ingredients. Well, I’ve eaten those all my life and if you are a sweet tooth, they are actually up your ally. A transparent plastic box protects the wonderful content. 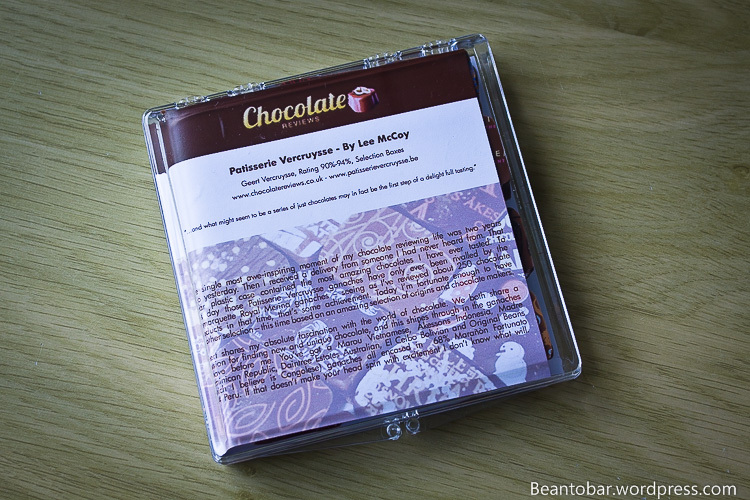 No wrapper, but a review written by Lee McCoy ( founder of the http://www.chocolatiers.co.uk website – a big name in the international chocolate world). Reading the text only makes you want to dig in! Opening the box, you are greeted by 12 gorgeous looking chocolates. 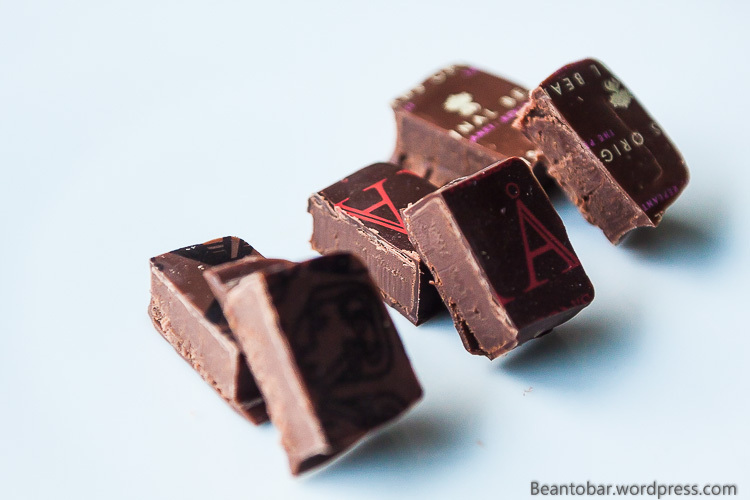 No fancy designs, but rectangular little blocks showing of some very interesting single origin chocolate names and other nice embossements. The smell coming from this collection is simply overwhelming. This particular box will cost you € 10. Describing all these chocolates would take too much time and effort and would take my attention away from the amazing taste experience, but I’ll give you some impressions. Sadly, Geert doesn’t provide the buyer with info on each chocolate and filling, due to the fact that his collection isn’t a fixed one, rather following the inspiration of the maker as he goes. This means the content will change several times a year. Somehow it even makes tasting these creations even more exciting. The pink star one: I started with this chocolate. It did hit me full in the face with an amazing, velvety ganache producing intense nutty and creamy, caramel flavors including small pieces of nuts, covered in a soothing milk chocolate. While sweet, it doesn’t clog the palate, nor leave you with that clingy feeling of overly sweet bulk chocolates. The aftertaste was even more remarkable, as it brings the nut flavors back to the front in an unexpected way. The El Ceibo one: It’s hard not to be impressed when you are thrown all the way to the other spectrum of tastes in chocolate. This deep dark ganache covered in more dark chocolate is earthy in its start. Powerful. The buttery texture of the ganache softens the taste a bit, while it still stands as masculine and dark. Coffee notes and roasted nuts pop up, before the long aftertaste kicks in. The blue dotted one: And zap, another spectrum opens. This chocolate brings fresh, green zings to the tongue. Floral notes mingle in and slowly turn over to toffee type flavors. One more surprise to see how Geert seems to be able to capture the essence of all the different chocolate flavors in these ganaches. The Marou one: Spices! And lots of them. 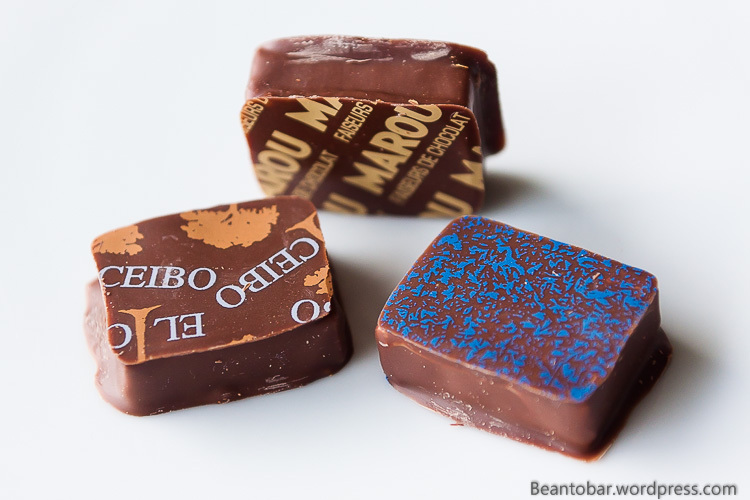 I was fortunate to taste some Marou bars a while ago, and this chocolate immediately threw me back to that tasting. Gingerbread, cinnamon and herbal notes open up, before chocolate-coffee-caramel-notes seem to be gliding in from the ganache. A nice smoky and slightly woody finish make this particular one very impressive! The one with the Mayan drawings: Preserved citrus fruits. As clear as the sun in the sky on a glorious summer day. Combined with a smoky milk chocolate. The favorite of the teenager in my family. The Akesson’s one: Dark and powerful. Rich dark chocolate and lots of red fruits and a slight acidity making me quiet sure this is Madagascan cacao. 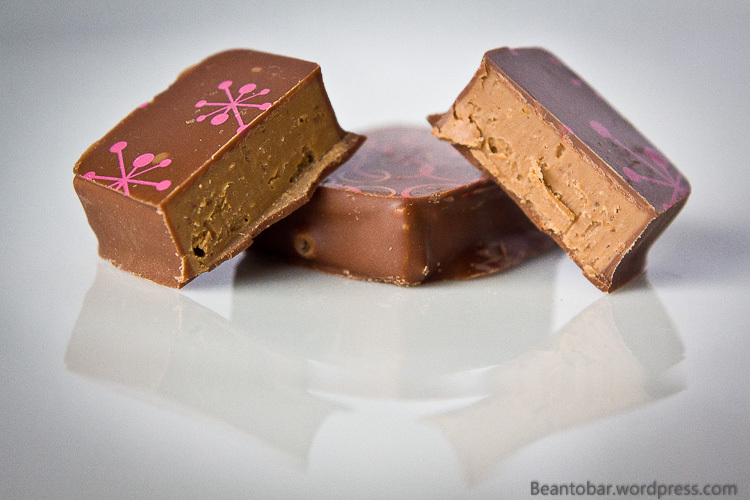 A ubersoft ganache brings balance to the taste, while a pleasant and gentle bitterness accentuates the power of the dark chocolate used. One of my prefered chocolates. 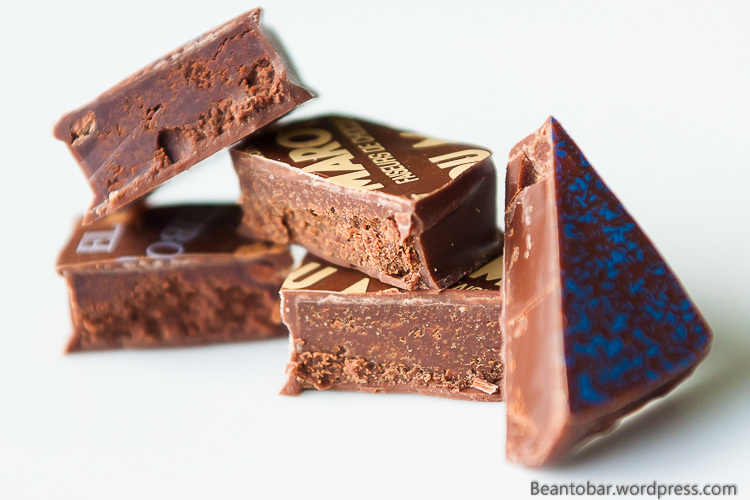 The Original Beans one: Pretty particular in taste, this chocolate brings a powerful starting flavor, moving over to salty caramel followed by a gorgeous smoky end. The one with the rings: Last one on my list so far, this little square blows you away with roasted hazelnut. 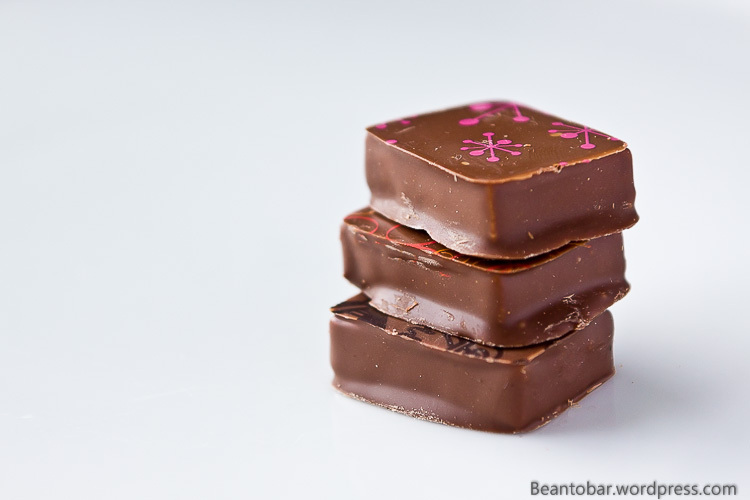 Praliné, but done in such a way it brings the nutty taste to the tongue every so clear and refined, without the over sweetness of other producers’ chocolates. In this case, the milk chocolate and filling seem to work together to create a taste explosion in your mouth, ringing on long after the chocolate actually dissipates. Products like these make ma happy. Very happy. It steps away from mediocrity and takes you to places and aroma’s you would never expect in a “piece of candy”. Geert Vercruysse surely knows what makes good chocolate and makes all these wonderful discoveries available in one single little box. Not a single chocolate lover should leave the opportunity to taste this products aside when he/she is in Belgium. Geert Vercruysse is the name to look for, Kortrijk the city you need to go!